The magnitude of marketing year ending stocks may be the single most important factor that summarizes the price implications of the U.S. corn balance sheet. While there are obvious limitations to the explanatory power of a single price factor in a market in which price is determined by the dynamics of a number of supply and demand factors, the corn market clearly reacts to the USDA forecast of marketing year ending stocks contained in monthly WASDE reports. Given the importance of those forecasts, it is useful to examine the accuracy of the forecasts. In addition there has been considerable discussion of the corn stocks estimates in the most recent May 2014 WASDE report, with many analysts arguing that the old crop estimate was too low and some arguing that the new crop estimate was too high. Here, we summarize the accuracy of the forecasts of marketing year ending stocks of U.S. corn for the 1990-91 through 2012-13 marketing years and discuss the implications for the May 2014 WASDE ending stocks estimates. The marketing year for U.S. corn extends from September of the year of harvest through August of the following calendar year. 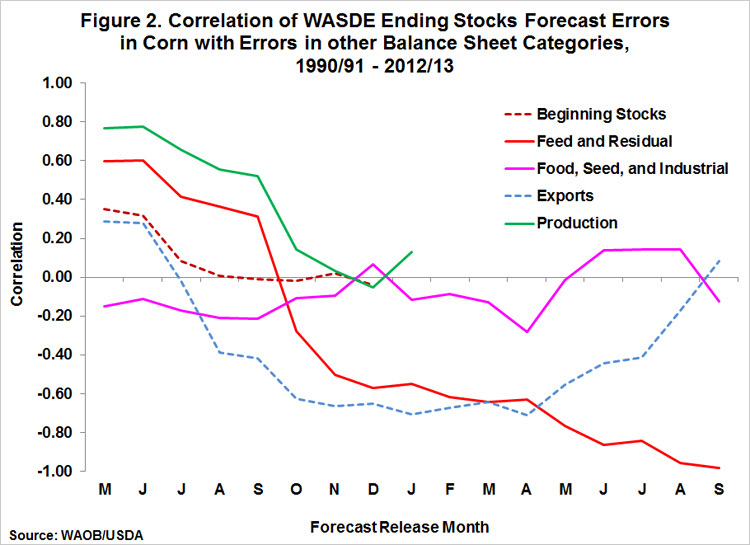 The USDA issues the first WASDE forecast of marketing year ending stocks in May before harvest. Those forecasts are updated monthly in WASDE reports released between the 9th and 12th of each subsequent month. The official estimate of marketing year ending stocks is contained in the USDA Grain Stocks report released at the end of September in the year after harvest. As a result, there are 17 monthly USDA forecasts of marketing year ending stocks that begin in May of the year of harvest and ending in September of the year after harvest. Forecast errors are calculated as actual year ending stocks minus the forecast of those stocks so that a positive difference represents an under-estimate by the USDA and negative difference represents an over-estimate. Figure 1 summarizes the accuracy of each of the 17 monthly forecasts of ending stocks for the 23 years from 1990-91 through 2012-13 using box and whisker plots. For each month the box represents the range of forecast errors in the 25th to the 75th percentile of all errors over the 23 year period. That is, the middle 50 percent of the forecast errors were within the range represented by the box. Fifty percent of the errors occurred outside the range of the box and the whiskers (lines) represent the maximum forecast errors for each month over the 23 year period. As an example, the middle 50 percent of the errors in the forecasts released in May before harvest were between an over-estimate of 475 million bushels and an under-estimate of 301 million bushels. The maximum over-estimate was 1.268 billion bushels and the maximum under-estimate was 1.371 billion bushels. As would be expected, the forecasts tended to become more accurate through the forecast cycle as more and more information about crop size and consumption became available. Still, surprisingly large errors were experienced late in the forecast cycle. In addition to the general pattern of errors, there are other important aspects of forecast errors. One important aspect of the forecasts of ending stocks is whether the forecasts are unbiased. That is, are the average errors near zero? As can be seen in Figure 1, the monthly forecast errors do not center on zero, with a tendency towards under-estimation of final ending stocks in 15 of the 17 months. The magnitude of the monthly bias is generally small, less than 50 million bushels for 10 of the 17 months. The largest bias is associated with August (+85 million bushels) and September (+95 million bushels) forecasts in the year of harvest. None of the monthly bias calculations are statistically different from zero. So, from a statistical standpoint the ending stocks forecasts in all months are unbiased. A second important aspect of the forecast errors is the source of the errors. Errors are the result of errors in the forecast of other elements of the corn balance sheet. Throughout the forecast cycle, there may be errors in forecasting corn consumption in each of the three major categories of feed and residual use, food, seed, and industrial use, and exports. In addition, errors in the forecast of crop size may be present from May before harvest through December after harvest since the USDA final production estimate is not released until January after harvest. Finally, errors in the estimate of stocks at the beginning of the marketing year may be present from May before harvest through September of the harvest year since USDA’s September 1 stocks estimate is not released until the end of September. The estimated magnitude of imports may also be a source of error in the forecast of ending stocks, but since that is typically a small amount it was not considered in this analysis. Figure 2 summarizes the analysis of the source of forecast errors for year ending stocks. For each of the five balance sheet items, a simple correlation is calculated between the forecast error for ending stocks and the forecast error in that balance sheet item for each month during the forecast cycle (+1 perfect positive correlation; -1 perfect negative correlation). As indicated, the highest correlations are for production forecast errors, export forecast errors, and feed and residual forecast errors. As expected, errors in production forecasts dominate early in the forecast cycle and errors in feed and residual forecasts dominate late in the forecast cycle. At first glance, the pattern of positive correlations for all balance sheet categories early in the forecasting cycle, except food, seed, and industrial, may seem odd. This actually makes sense since production and usage errors will tend to be positively correlated before harvest. If a large production forecast is made then larger usage forecasts will also tend to be made and vice versa. This linkage is cut once the size of the crop is determined. The analysis of forecast errors of year-ending stocks can be applied to the most recent forecasts contained in the May 9, 2014 USDA WASDE report. The report contained the first forecasts for the 2014-15 marketing year and year ending stocks were projected at 1.726 billion bushels. Historical forecast errors suggest that there is a 50 percent probability that actual year ending stocks will be between 1.251 billion and 2.027 billion bushels. There has been a slight bias towards over-estimating year ending stocks in this report in the past, with an average error of -42 million bushels. In addition, the May forecast this year includes a forecast of record high average yields and a year-over-year decline in consumption of U.S. corn. This combination suggests that actual year ending stocks will be smaller than the May forecast. For the 2013-14 marketing year, ending stocks were forecast at 1.146 billion bushels. Historical forecast errors suggest that there is a 50 percent probability that actual year ending stocks will be between 1.121 billion and 1.267 billion bushels. There has been a slight bias towards under-estimating year ending stocks in this report in the past, with an average error of 49 million bushels. This bias seems to support the market’s expectation that USDA has over-estimated marketing year exports, and therefore, under-estimated year-ending stocks. However, our previous analysis suggests that errors in forecasting year ending stocks late in the marketing year are more highly correlated with errors in forecasts of feed and residual use. We further examined the errors in the May WASDE forecast (after harvest) of year ending stocks by examining the relationship of the change in the forecast from April to May with the error in the May forecast. That is, we calculated the May forecast error conditional on the change in the forecast in May. Those results are summarized in Figure 3 where the change in the forecast of ending stocks from April to May (after harvest) is plotted on the horizontal axis and the error in the May forecast is plotted on the vertical axis. The predominance of observations above the horizontal axis verifies the tendency for USDA to under-estimate year ending stocks in May. The positive relationship between the change in the forecast in May and the error in the May forecast, however, indicates that an increase in the forecast of ending stocks in May tends to be associated with an under-estimate of year ending stocks and a decrease in the forecast in May tends to be associated with an over-estimate of those stocks. While the fit is not great, the relationship is interesting. The relationship supports the concept that the USDA tends to “smooth” the changes in the projection of year ending stocks through the forecast cycle. This is not surprising since similar results have been reported previously for USDA corn production forecasts. The forecast of 2013-14 marketing year ending stocks declined by 185 million bushels from April to May this year. Reading directly from the line fit in Figure 3, the change suggests that the current forecast of year ending stocks is 139 million bushels too high. The fit is not good enough to generate a lot of confidence, but that result is very different than current market expectations that year ending stocks will exceed the current USDA forecast. A large over-estimate of year ending stocks would imply that the forecast of feed and residual use of corn is too low. 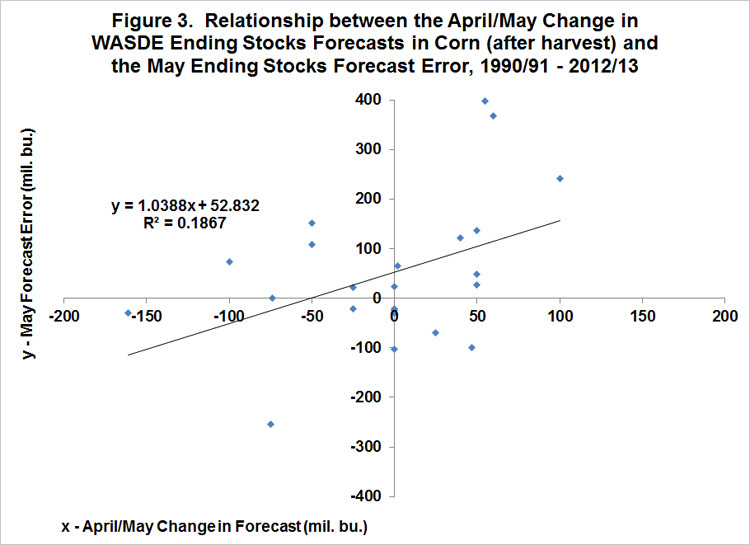 We summarize the accuracy of WASDE forecasts of marketing year ending stocks of U.S. corn for the 1990-91 through 2012-13 marketing years and discuss the implications for the May 2014 WASDE ending stocks estimates. Three main implications emerge. First, WASDE ending stocks projections for U.S. corn across the forecasting cycle are basically unbiased, having only a slight tendency towards under-estimation of final ending stocks. 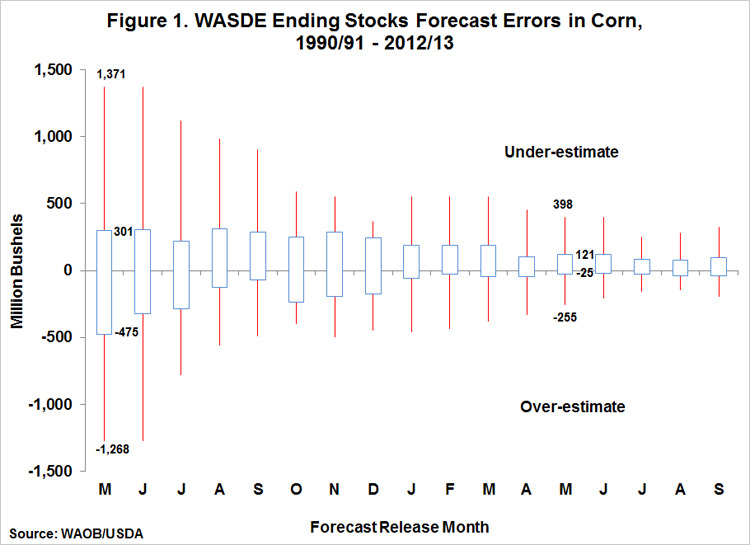 Second, the first WASDE estimate of ending stocks for U.S. corn, released in May before harvest, has a large potential range of errors. This is sensible since the ending stocks forecast at this early point in the forecasting cycle reflects both production and usage errors. Third, there is a clear tendency for the USDA to “smooth” the changes in projections of year ending stocks later in the forecast cycle. This tendency suggests that the WASDE ending stocks forecast for the 2013-14 marketing year released earlier this month (1.146 billion bushels) may be over-estimated. Intriguingly, this is the reverse of current market expectations that year ending stocks for 2013-14 will exceed the current USDA forecast. Isengildina, Olga, Scott H. Irwin, and Darrel L. Good. "Are Revisions to USDA Crop Production Forecasts Smoothed?" American Journal of Agricultural Economics 88(2006):1091-1104.